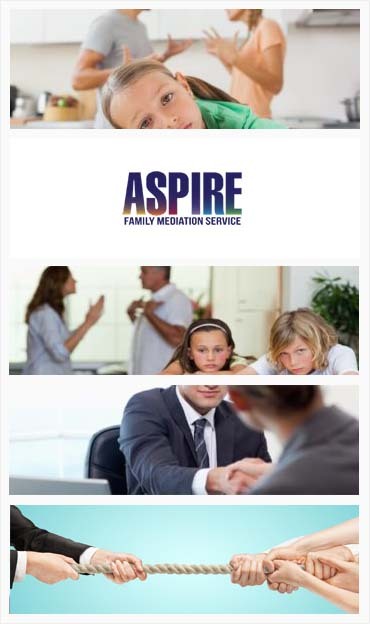 Aspire family Mediation Are the local family medition exsperts offering fast and profeshinal help when getting divorced or seperating involving children or financial related matters. Contact us Today to learn more. Recently separated from your partner ? Stressed out about whats going to happen to the children, house, pensions debts? Cant seem to be able to have a conversation together about the issues? Who is suitable for family mediation ? It is said that family mediation can transform an ending into a new beginning. Family mediation services are basically meant for individuals who were once satisfied and happy with their lives but then due to an unexpected turn of events, they entered a downward spiral and seem to have no way out. This kind of service can be defined as an alternative dispute resolution technique which is meant to be used by individuals who are experiencing problems with their family members. Through this process, both the parties will be able to have confidential communication and reach a mutual agreement through the assistance of a family mediator, who is a neutral person. Basically, the mediator acts as a catalyst for the purpose of keeping the lines of communication clear between the two disputants as well as clarifying legal issues arising in the process. Our family mediation process is generally aimed at resolving disputes like child custody, ownership issues, land issues and finance issues arising due to separation, divorce, etc. Our family mediation services can also be used for the purpose of dealing with issues like pet allocation, visitation rights, welfare of the ill family members and so on. A typical mediation session lasts for a couple of hours. However, at times the mediator may feel that that the resolution is not around the corner and there are more issues that need to be dealt with. In such cases, the mediator would recommend scheduling further sessions to reach the solution. The process of family mediation is extremely confidential because the mediator conducts such sessions in the strictest of confidence. Moreover, since the information divulged in mediation processes cannot be used in court without the consent of both the parties involved, therefore one doesn’t have to worry about the secrecy of such sessions. When a resolution arises during the family mediation session and both the parties mutually agree to the same then a summary would be prepared by the family mediator which will then be presented to a solicitor for the purpose of compiling an agreement. The agreement will then undergo legal binding and both the parties involved will be required to sign the same. Why should one use family mediation services? What are the benefits that can arise out of this move? Well, it is quite obvious that this kind of service is advantageous because a lot of people prefer to go for this service rather than approaching a lawyer or an advocate. The first and foremost benefit offered by family mediation is that it handles sensitive issues like family breakdowns with utmost delicacy and confidentiality. Moreover, our family mediators are qualified and trained professionals who not only have the experience but also the expertise required to carry out the job. Another top benefit offered by family mediation services is that it provides a cost-effective and fast way of resolving family disputes. With family mediation services, one wouldn’t have to take matters up to the court and nor would it be necessary for the two parties to be represented by lawyers. Family mediation services are completely voluntary in nature, it is up to you as an individual to take the call on the date, time and venue of the mediation process. While there are many options available in order to resolve family disputes and major issues in the family, it would be best for one to opt for family mediation as it is a sensible, effective, reasonable and practical way of dealing with these troublesome but important issues. I’m forever in debt to Aspire Family mediation, my marriage was almost over but the mediators here brought it back from the brink of ‘the end.’ Thanks you so much Aspire. I dun know what I would have done without my hubby if I would have lost him for such petty issues.